You can pack a bunch of stuff in this handy pack. The main compartment is 9" x 8" x 3" with front and back sub-dividers. There is a front compartment which is 7" x 6.5" x 1.5" with a mesh divider. One side compartment is 6" x 3.5" x 2" with a divider and double zippers to accommodate an antenna. 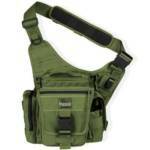 Another side compartment is 7" x 3.5" diameter with a cinch that can be compacted for low profile carry. The top of lid pocket is 6.5" x 3" x 1". It has high strength zippers and zipper tracks, UTX-Duraflex nylon buckles for low sound closures, and is triple polyurethane coated for water resistance. Remember the days when we used to hold a mini-mag in our mouths to get jobs done in the dark? Thankfully, headlamps now give our mouths a reprieve! This little clip-on headlamp is bright enough to get the job done, yet light enough that you don't even know it is on your head. 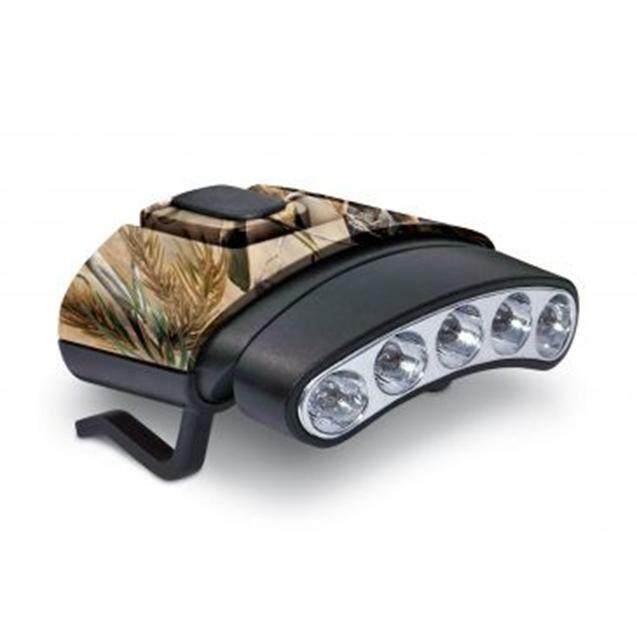 The light comes in a camouflage housing with 5 super bright LED bulbs that never need replacing. Includes white light module and green light module which can be quickly changed using easy snap & lock system. High impact housing. Contoured shape to fit cap brims securely. Top mount design does not obstruct line of vision. 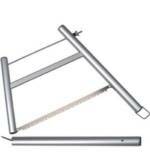 Module tilts 45 degrees for desired light positioning. Uses two CR2032 lithium batteries which are included. This world renowned take-down buck saw is a lightweight, collapsible saw with a Swedish steel blade that provides an efficient cut that will hold an edge. 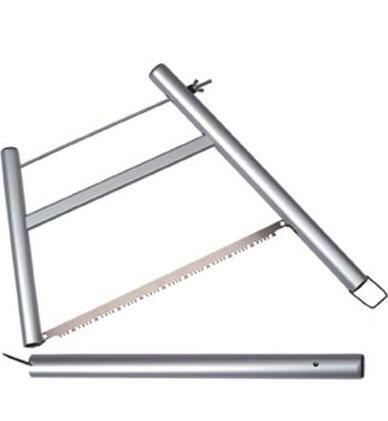 The anodized aluminum frame and stainless steel parts ensure a long lasting tool. In 1995, this saw received the Source Canada Award for excellence in manufacturing, and is now available worldwide. It is only 20 ounces and breaks down with all parts being stored in the handle. Can cut through wood up to 15 inches thick very quickly. This kit has everything you need for in-the-field care of your game as well as butchering and final preparation before cooking in one easy-to-carry hard-side carry case. The blades are crafted of high-carbon 420 stainless steel for years of flawless performance. The ergonomic Kraton handles ensure a comfortable, yet secure grip. 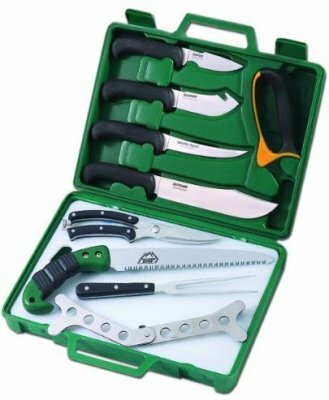 The kit includes a 3" caping knife, 4-1/4" skinner, 5-1/2" boning/fillet knife, 8" Bowie-style butcher knife, 10" double-ground wood/bone saw, 5-1/4" carving fork, heavy-duty game shears, 10" x 14" cutting board, three pairs of surgical gloves and a tungsten carbide V-style knife sharpener. Also includes the Steel Stick Ultimate Spreader to keep the body cavity of any medium to large-sized big-game animal open for easy field dressing. 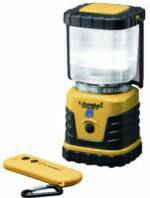 The Warrior Camp Lantern is a great lantern. It emits 230 lumens of light, is lightweight, and extremely tough! This lantern includes an infrared remote control that allows you to turn the light off and on from up to 25 feet away. The remote also allows you to dim the lantern from a distance. The LED lamp on the Warrior 230 can be adjusted to shine at any brightness level between 10% and 100% of its total rating, which makes it versatile enough to be used in just about any situation around the campsite. It is powered by three D-cell batteries and can run for 48 hours straight on its highest setting. Not only is it water resistant, but also its plastic housing is largely encased in rubber, which helps to protect it from normal abuse around the campsite. Surprisingly small and lightweight, the lantern tips the scales at just 1.9 pounds with batteries.